The idea of care management—managing a selected set of individuals to focus on reduced cost and better quality of care—has been around for a long time, primarily established in the payer space. However, with the growth of value-based incentives and risk-based contracting, healthcare provider organizations have started to think of care management, also called “complex care” and “disease management,” in the context of population health strategies. Care management, done at its best, will reduce the cost and increase the quality of care for those individuals identified in the program. While Medicare data suggests that only 5 percent of a healthcare organization’s population consumes 50 percent of its resources, health systems must look beyond that 5 percent and also use a strategy that will allow them to identify and work with the people they will impact the most. To achieve a full care management approach, most organizations have had to deploy multiple applications from multiple vendors—an expensive and frustrating experience. Additionally, most ACOs, Integrated Delivery Networks, and the like can have around 20 or 30 different EMR systems, spanning across the continuum of care, from post-acute settings to skilled nursing facilities, long-term care, and more. EMR suppliers: provider organizations have spent tens to hundreds of millions of dollars deploying EMR products for workflow and documentation at the point of care. 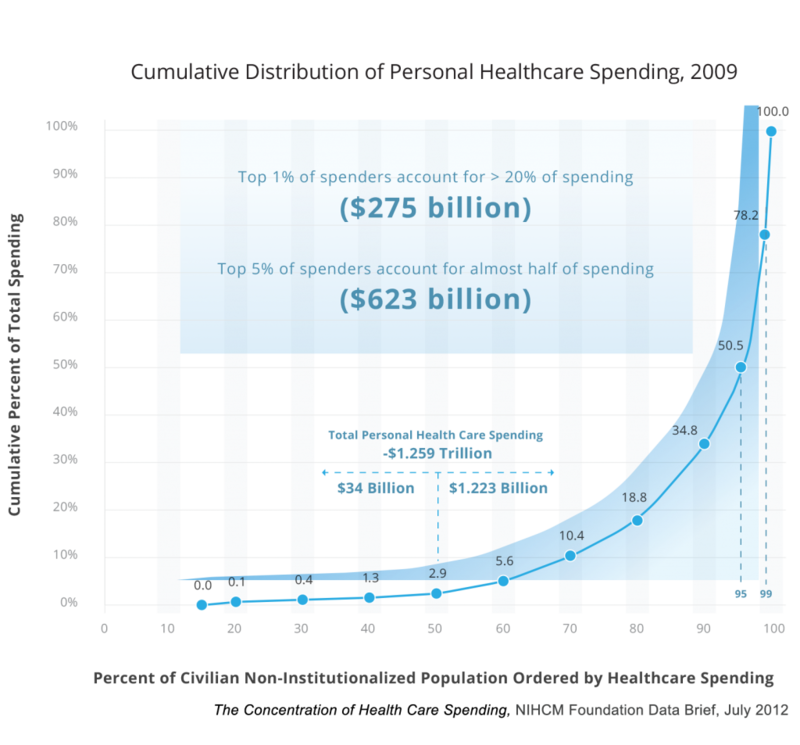 Health plans: in a fee-for-service and volume-based world, only the health plan was financially incented to address the top 5 percent utilizer members. These programs were often referred to as “case management.” These case management products for health plans are well established and feature rich—if you are a health plan and driven predominantly by claims data. Standalone products: as care management shifts from health plans to providers, a new crop of population health and care management products has risen to the surface. This includes big name players who acquired products and services, and small independent startups. Lack of an end-to-end solution. None can offer all five parts of a complete care management solution. EMR suppliers are weak in the analytics areas of patient/member stratification/identification and performance reporting/management. Also, they have proven poor interoperability among the multiple EMR suppliers found in most ACOs and IDNs. Health plan products, while mature, generally lack transparency, flexibility of stratification, and lack clinical data handling. The standalone suppliers are either a collection of poorly integrated parts or are point solutions focused only on care coordination or patient/member communication. To solve this problem, Health Catalyst® partnered with organizations who have had success in care management such as Allina Health in Minneapolis, MultiCare Health System in Washington state, Partners HealthCare in Boston, and Piedmont Healthcare in Atlanta to develop a unique process and technology called the Health Catalyst Patient Impact Predictor™ that dynamically generates portfolios of patients, prioritized by actionable suggestions for risk intervention. Current care management solutions use claims or EHR data, but rarely both, to stratify patients who meet two criteria: Those that are highest cost (with multiple complex conditions); and those posing the highest clinical risk. The Health Catalyst’s Patient Impact Predictor takes stratification to the next level with advanced client-configurable algorithms and variable weighting that analyze not only claims and EHR data together, but also socio-economic determinants, high-risk medication utilization, acuity of conditions, high-utilization predicted, and HCC scores. We call this concept maximizing your Return on Engagement™, a measure which will be an economic imperative for healthcare organizations who are at financial risk for achieving clinical outcomes and value-based care contracts. Are we managing the right group of people? Are we having an impact for those people? Is there variation between care teams that may help us identify and communicate best practice? 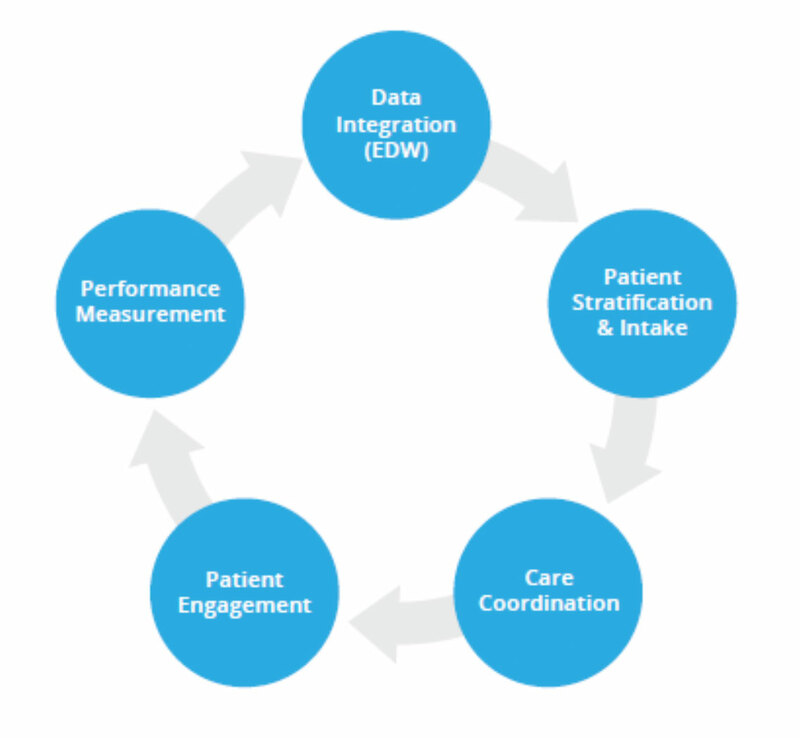 Health Catalyst’s Care Management Suite is healthcare’s first patient-centric, end-to-end, mobile-first population health solution that addresses all of these questions in five critical parts: (1) data integration, (2) patient stratification and intake, (3) care coordination, (4) patient engagement, and (5) performance measurement. Using advanced analytics, the Health Catalyst approach to care management can help organizations reduce the cost and increase the quality of care for individuals identified as highly impactable. This unique approach, Patient Impact Predictor, goes beyond simple claims, cost, and diagnosis data. It results in holistic care incorporating socioeconomic data, social, and more. #1—Data Integration: Aggregates, analyzes, and delivers data to the right people at the right time. Gives care team members access to multiple EMRs and data sources spanning the entire care continuum, from hospitals to pharmacies. #2—Patient Stratification and Intake: Uses an agile patient stratification process to integrate current utilizations and trends, chronic conditions, active medications, and social determinants from disparate clinical and claims data sources. #3—Care Coordination: Facilitates timely, all-inclusive care team communication and collaboration on patient assessments, care planning, and interventions. #4—Patient Engagement: Mobile-first approach (smartphone apps) enables secure, real-time, multi-point messaging, assessments, and care planning to engage and support all care team members (patients, friends, families, social workers, care navigators, etc.) across multiple EMRs. #5—Performance Measurement: Evaluates and reports on care management program effectiveness using metrics and measures appropriate to value-based contracting. Patient Stratification integrates current and cost trends, chronic conditions, and social determinants risk models and disparate sources to identify the individuals most likely to benefit from proactive care management programs. Patient Intake is a workflow application that enables list of patients created by other applications to be routed to a series of users based on roles. Users can add, update or remove patients from the list before routing the patient record to the next person in the workflow. Care Companion is a mobile phone application for patients which supports the engagement of patients with the Care Management team of nurses, pharmacists, social workers and others in the process of improving individual patient outcomes. Care Team Insights is a dashboard application for leaders in the care management organization to enable daily views of enrollment, utilization, risk, and cost by care team, facility, care program/family. In this webinar, Russ Staheli, SVP, presents a vision around how Care Management can help drive your system to this triple aim. Russ discusses and performs live demos of our brand new suite of tools that represent the first end-to-end care management solution in the industry and the first to enable discovery of an otherwise invisible subset of patients – those who will benefit most from care management and who can be engaged most effectively to lower the cost of care. 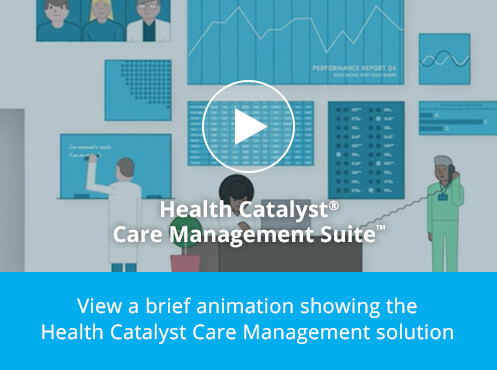 To learn more about the Care Management Suite, Health Catalyst, and how our solutions and products might fit your needs.